Blues has spread far from its roots, with artists all over the world using this genre as a universal language. Today one can see blues shows in Germany, Japan, the south Pacific or any of the former Soviet Republic states. There are even Chicago bluesmen in deepest darkest New England, which is where you will find the fine folks from Ryan Hartt and the Blue Hearts. This quartet was formed in 2000, and has honed their craft via the time-honored method of relentless touring. Ryan Hartt provides lead vocals and harmonica, with Eric Ducoff on guitar, Jeff “JB” Berg on bass, and Nick Toscano on the skins. Ducoff and Berg also provide some backing vocals. Call My Name is their third release, and their first since 2005. There is not a cover tune or old standard to be found amongst the eleven full-length tracks on this album (number twelve is a brief instrumental). Hartt took care of most of the writing chores, with Ducoff helping out of a few tracks, as well as writing “Real Prince Charming”. Berg penned “When it Rains” and provided the slide guitar for it as well. “Anti-Blues Pill” is the first track on the album and sets the stage by letting everybody know that the Blue Hearts are first and foremost a blues band. Ducoff’s dirty Texas guitar tone and Hartt’s harp emerge through a thin veil of static effect, and the rhythm section joins in to keep things slow and grooving. Ryan’s voice is mature and has a growly Midwestern twang without no hint of New England influence. This is one of the strongest tracks on the album and is a wise choice to kick things off. There are no surprises in the next four tracks, as they are all solid rocking blues songs. Ducoff and Hartt continue to play off each other while Berg and Toscano keep things moving along no matter what. By the way, the honking harmonica on “Love at First Sight” is just awesome, and has to be heard to be believed. Just when the listeners are getting used to flow of things, “I Choose the Blues” smacks them in the head like a pillow that has been soaked in an icy-cold vat of sadness. This song changes the whole tone of the album and shows you the depth of their songwriting abilities as well as the tightness of the band as they respond as one to Hartt’s phrasing of the vocals. This is the sound of a band that has played together for a long time and knows each other like brothers. After this sobering moment, the album second part of the album resumes with upbeat tunes like “Real Price Charming” and the Ska-infused instrumental “Kaboom.” I love the syncopated guitar and raw harmonica on this tune and don’t know how anybody could hear it and not be in a good mood. Some of the gnarliest guitar tone I have ever heard can be found on “New Love, Old Love Part II”, and I am truly jealous of what Eric Ducoff put together for this track. He really shines on this song and has the perfect counterpoint to Hartt’s huge harmonica sound. “Dartboard” is one of the more awesome takes on the life of playing in bars, and gives throws out clever lyrics that would be an endless string of clichés if they didn’t hit so close to home. And who would have thought there would be four bars of Reggae on a blues album? Call My Name finishes up neatly with ”Love at Last Sight” which is a brief instrumental that reprises the theme of “Love at First Sight” as an outro. This is a clever way to tie everything together, and is just the tip of the iceberg of how well this project was produced. 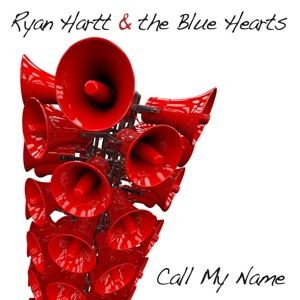 Ryan Hartt and the Blue Hearts had a gap of seven years between albums, and they have put that time to good use in assembling an album that is well-written and works together as a whole. It deserves to be listened to as a whole and you should not shortchange yourself by cherry-picking single tracks off of iTunes. Call My Name is a solid Chicago/west coast blues album that is innovative without straying too far from the basics of the blues, so you really should check it out, and be sure to catch one of their shows if you are in New England - they play out almost every weekend.